Kiev is one of the oldest cities in Eastern Europe and the capital of Ukraine. 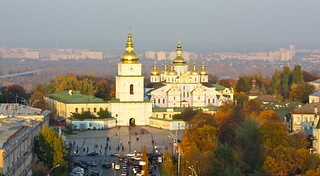 Today, Kiev is an important historic, cultural, industrial and educational centre with many unique landmarks. Kiev’s been established since the 5th century, when it was a Slavic settlement on the Constantinople/Scandinavia trade route. It then passed into Viking hands, became a capital of the first East Slavic state, was eventually destroyed by the Mongols and re-emerged into prominence during the late 19th century during Russia’s industrial revolution. Ukraine became independent first in 1917 and again in 1991, after the collapse of communism. Walking under the horse-chestnut trees in the summertime is a lovely way to see most of the historic part of the city. The Kiev city centre is very lively during summer evenings, with streets closed to traffic. St. Michael’s Golden-domed Monastery at Mykhailiv Square is magnificent. while Besarabsky Market is huge and very colourful. A walk along the historic Andriyivskyy Descent, a visit to the monument of Yaroslav the Wise, the Castle of Richard Lionheart and to the baroque church of St Andrew are highly recommended. A stroll along the ancient city walls (The Golden Gate) provides excellent views of Kiev and the surrounding countryside. Kiev’s two botanical gardens and many parks are excellent. Amongst the many river islands, Venetsianskyi with its beaches, amusement park and night life can be reached directly by the famous Kiev metro. Visit the National Botanical Garden for views of the Old City, Kiev’s left-bank and Vydubychi Monastery. Alternatively, Peremohy park is ideal for jogging or cycling in the summer and ice-skating or fishing in winter. Kiev’s 40 museums.include one about the Great Patriotic War (on the right bank of the River Dnieper) and the National Art Museum of Ukraine. The small Ukrainian National Chernobyl Museum is an interesting modern era place to visit. The Museum of Folk Architecture and Life of Ukraine is a mini-village featuring traditional architecture. It is by Pyrohiv village, just outside the city to the south and a recommended day visit.